Sometimes I receive letters from other daughters who tell me stories of the “Mary” in their life, often strikingly similar to my Mom. This story is one of those. Grab a tissue. I am hoping to meet up with Jennifer when I present the play in the Ft. Myers area next spring on behalf of the Shellpoint hospice where Mom died. 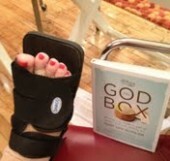 I just read The God Box. Thank you. I’m amazed at the similarities in our lives and would like to share them with you. My mother’s name was Josephine Maye. She was a devout Catholic and was a Franciscan nun for 6 years before she met my Dad. Some of her friends called her Mary Jo. Shortly before she passed away in May, 2010, she told me that she named me Mary after Mother Mary, since she was named after Joseph. My name is Mary Jennifer Kirchman but I always went by my middle name. My Mom and I were best friends. I’m an only child and have no children and my Mom and I were all we had. I always strived to be a perfect daughter, and as my Mom lay dying, she told me I had been a perfect daughter. My Mom and I loved watching movies together and eating out, especially Mexican food and margaritas. I don’t think it’s a coincidence that she died on May 5, Cinco de Mayo (month of May, her middle name being Maye). She also loved the song “Spanish Eyes”. Your Mom’s first letter was dated August 7, my birthday. My Mom’s God Box was that she kept all the letters and postcards I ever sent her. Some are over 30 years old. She also saved my most precious baby clothes. I found these in a box after she passed, all starched and in perfect condition. My Mom and I also had a “more”. I would say “I love you much” and she’d say “I love you more”. Her last words to me were “Me more” after I told her “I love you much”. I attended Catholic grade school and high school. My Mom and I always went to Mass together. And I too wore the veil. I also drifted away from the Church after my Dad died. I was angry at God and had had enough of his promises. However, God used my second husband to bring me back to my faith, and I know my Mom was very happy about this. My marriage didn’t last, but my faith is stronger than ever. I go to Mass at least once a week and went to Confession for the first time in 30 years. I even make rosaries. My Mom also didn’t care for cooking. I grew up on grilled cheese sandwiches and microwaved dinners. Your Mom’s autobiography had a picture of my favorite flower on it, a daisy. But one thing in your book that made me gasp was that they lived at Shell Point in Fort Myers. My Mom and I also live in Fort Myers. My family moved here in 1978. My Dad and Grandmother are buried here. My Mom is at home with me, (cremated) in a house we used to share. I have no living relatives, am single with no kids. But my Mom’s love and spirit is always with me. And I’m most proud in this life that I had her for my Mom and that I was her love and joy. Thank you for taking the time to read this. I’ve never written to anyone like this before but your book touched my soul. I think my Mom would be happy I read it and wrote you. I would love to hear your stories, please write to me at hello@theGodBoxproject.com or post comments here! There isn’t a day that goes by that I don’t see some glimpse of my mother in me. But breaking my foot on a New York sidewalk is too close for comfort. Last week I cracked my 5th metatarsal when I leapt to save my little dog Rocky from the jaws of a mastiff that Rocky had—somewhat impertinently!—sniffed. Now I am dragging an UGG-ly boot around Manhattan that cannot be made to look cute no matter what I do with it. My mother would understand. A couple years later, Mom sprained her ankle again, this time at home in Philadelphia. She was trying to stay off it but Dad wanted her to ‘get her mobility back’ as he said. “Hey, Mary, let’s take a walk outside.” Begrudgingly, Mom hobbled to the door, took one step out and sprained the other one. Not a high point in our family’s medical history. So, in honor of Mom, I will grin and bear it. And be glad that at least it’s not sleeting and I’ve got an elevator, a cab and if necessary, will hitch a ride on Rocky. It’s the least he can do!